The difficulty of this process does not lie in promoting the website to search engines but rather in structuring the content so that the page is positionned high in the results for the chosen keywords. Indeed, a majority of Internet users use search engines in order to find information and search for this information with the help of keywords. Therefore companies and organizations must first focus on the content that their websites offer in order to best meet the needs of Internet users and then identify the keywords that are likely to be entered by these users. Search engines seek above all to give their users a quality service by giving them the results that best match their search. So before companies and organizations even think about web positionning, they must endeavor to create consistent and original content. Original content does not mean content that is offered by no other website; that would be virtually impossible. It is however possible to deal with a subject and give it an added bonus by going more in-depth on certain points, organizing the information in an original way or relating different pieces of information. On the other hand, still with the goal of supplying visitors with better content in mind, search engines attach importance to updating information. Updating a website's pages serves to either increase the rating given by the engine to the website or how often the indexing robot visits the site. The title is the best element for describing the page contents in just a few words. Because it is the first information that the visitor reads on the search engine's results page, special importance must be attached to it. The title of a webpage is described in the webpage's header in between the tags <TITLE> and </TITLE>. The title must describe the webpage's content as precisely as possible (in under 7 words and 60 characters). The title is all the more important because it will appear in the user's favorites as well as in the search history. Some search engines attach major importance to keywords present in the URL, especially to keywords that appear in the domain name. Companies and organizations are advised to use a fitting file name that contains one or two keywords for each of the websites files rather than names like page1.html, page2.html, etc. In order to enhance the content of each page as much as possible, the content must be transparent (in contrast to opaque content such as Flash), i.e. it must contain as much text as possible that is indexable by search engines. Above all, page content must be high-quality content aimed at visitors. However, it is possible to improve it by making sure that different keywords are present. Frames are strongly advised against because they sometime keep websites from being properly referenced. Meta tags are non-displayed tags that are inserted at the beginning of an HTML document in order to subtly describe the document. Among these tags, keywords and description tags are ways to add keywords and a description to the page without displaying them to visitors (e.g. terms in the plurial form and even with intentional spelling mistakes). HTML codes should be used for letters with accents. No more than 20 keywords should be included. Meta robots help define what a robot should do on a page, notably by indicating whether or not the page must be indexed and if the robot is authorized to follow the links. Given the abusive use of meta tags in a large number of websites, search engines now use this information less and less when indexing pages. In order to give each of your pages maximum visibility, you should set up internal links between your pages to allow indexing robots, or crawlers, to browse your entire website structure. Thus, creating a page that presents your website's architecture and contains links to each of your pages might be a very good idea. In addition, it is important to have external links pointing to your website because this increases your site's traffic and visibility and because some search engines take into account the number and quality of the links pointing to a site when defining relevancy (this is true for Google, which has a PageRank index). A website's images are opaque to search engines, i.e. they are not capable of indexing image content. Therefore, it is a good idea to place an ALT attribute on every image that describes the content. The ALT tag is also of utmost importance for the blind who browse the Internet with a Braille terminal. 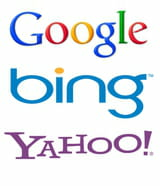 The items that search engines index are webpages. Therefore, when designing a webpage, the above-mentioned advice must be taken into account when structuring each page. Most webmasters remember to correctly index their website's home page but neglect the other pages, even though it is the other pages that contain the most interesting information. It is therefore absolutely imperative to choose an appropriate title, URL and meta tags (etc.) for every page of a website. Latest update on April 3, 2013 at 09:40 AM by Marjorie Gaulier. This document, titled "SEO," is available under the Creative Commons license. Any copy, reuse, or modification of the content should be sufficiently credited to CCM (https://ccm.net/).